The German 88mm Flak has to be considered the most famous artillery piece of World War II. Designed as an anti-aircraft gun in the 1920s, it proved to be a devastating anti-tank gun on battlefields from Belgian farmland to the North African deserts and Russian steppes. Like many weapons of the Third Reich, there was a bewildering proliferation of models and variants. The 88s equipped armored trains, concrete flak towers, and, eventually, the fearsome Tiger tank. Hitting aircraft in flight with a projectile is a very difficult technical problem. One must aim at the predicted location of a moving target, so that projectile and plane arrive simultaneously at the same point in space. “Small plane, big sky,” say the air defense gunners. By the 1930s, two solutions evolved: light automatic AA, firing small (20 to 57mm) shells at a high rate, and medium-to-heavy AA (75 to 128mm) firing explosive shells time-fused to detonate at the predicted point, filling the sky with shrapnel. Because the Versailles Treaty prohibited Germany from developing new weapons, the “88” was designed by Krupp engineers in Sweden. Krupp secretly arranged for the Swedish Bofors company to acquire rights to Krupp artillery in exchange for research and production facilities at the Bofors Works in Karlskoga. 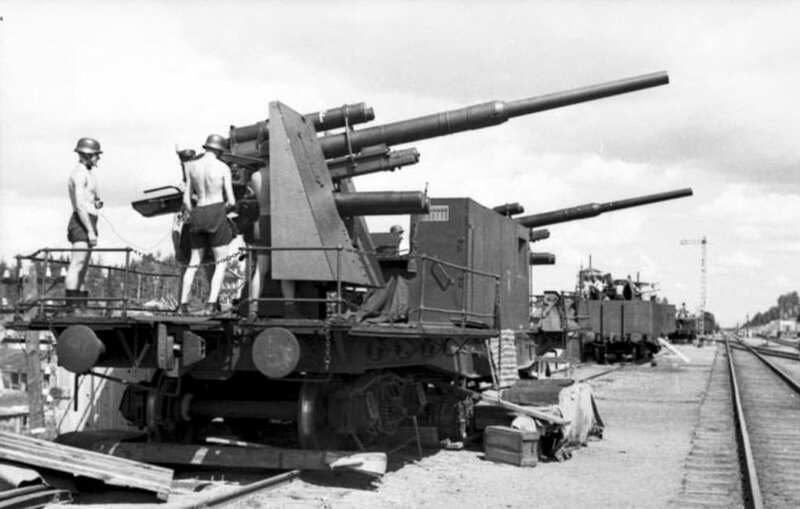 After rejecting 75mm designs, the team settled on 88mm (8.8cm/3.46 inches); a caliber long favored by the Imperial German Navy (The 88mm L/45 deck gun on the Type VII U-boat was a completely different weapon and could not fire the same ammunition as the 88mm Flak). The prototype Flak 18 appeared in 1928. After Hitler took power in 1933, Germany rapidly re-armed. When World War II began, more than 2,500 Flak 18, or improved Flak 36/37 models, were in service. 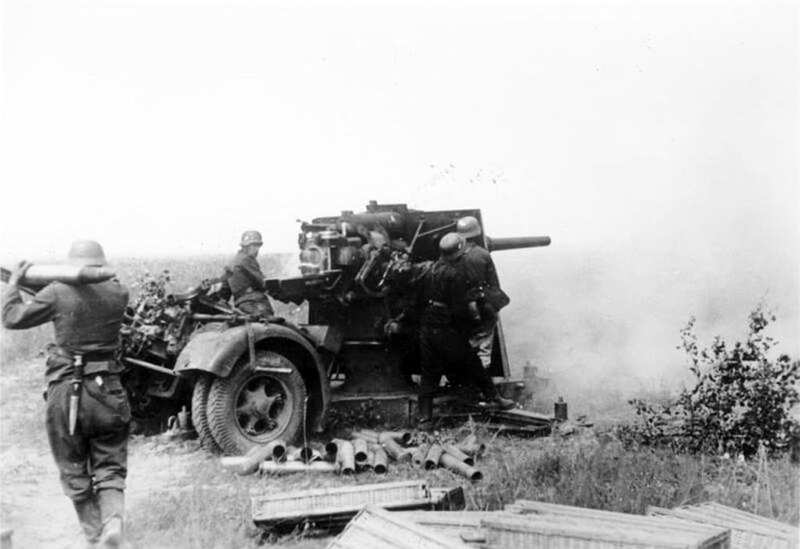 In the Spanish Civil War (1936-39), the German Condor Legion deployed a mobile flak detachment with 88s, which proved accurate and versatile in combat. Most 88mm guns served in Luftwaffe flak regiments (24 guns) or Wehrmacht mixed anti-aircraft battalions (FlaK Abteilungen with 4 to 8 guns). 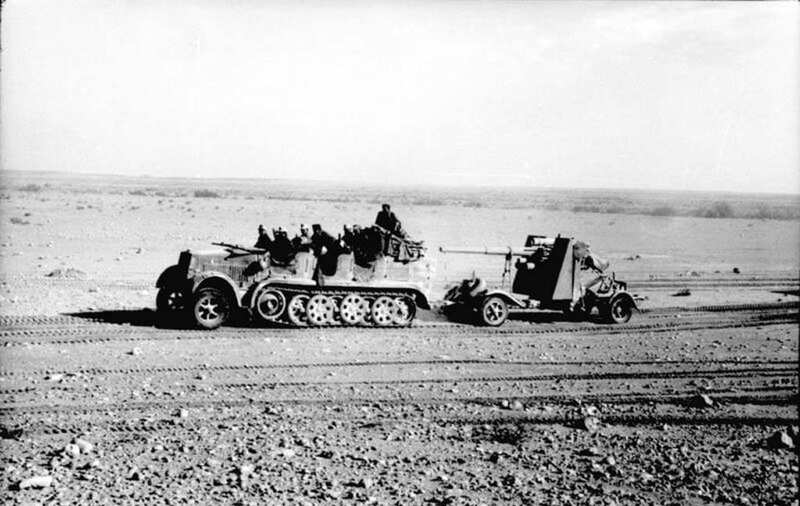 In June 1941 at Halfaya Pass on the Libya-Egypt border, thirteen dug-in 88s from the flak battalion of Rommel’s 15th Panzer Division decimated repeated British tank charges. Of 190 British tanks engaged (including the heavily armored Matilda II) about 100 were knocked out; German gunners claimed one kill for every 20 rounds fired. Most 88mm guns served in Luftwaffe flak regiments (24 guns) or Wehrmacht mixed anti-aircraft battalions (FlaK Abteilungen with 4 to 8 guns). The 88 was typically towed by a half-track (Sd.Kfz 7 or Sd.Kfz 11) with seats for the ten-man crew and some ammunition. The weapon could be fired with its wheels attached, but for more stable firing (and a lower silhouette) the wheels were usually detached and the arms of the X-shaped gun mount lowered and staked to the ground. There was a leveling jack at the end of each arm. A trained crew took about two minutes to bring the piece into action. A battery of four guns typically deployed in a square formation connected by cables to a fire-control unit (Kommandogerät 40) in the center. A battery of four guns typically deployed for the anti-aircraft role in a square formation connected by cables to a fire-control unit (Kommandogerät 40) in the center. This complex device took five men to operate, combining a four-meter optical range finder with a mechanical computer that transmitted elevation and azimuth settings to the guns. For direct fire against ground targets, each gun had a ZF 20-E telescopic sight. The 88 fired three main types of ammunition (88 x 571R). High-explosive shells with spring-wound or inertia-operated time fuse (up to 30 seconds) were fired at air targets. High-explosive shells with percussion fuse (impact or 0.11 second delay) were fired against ground troops or fixed targets. Armor-piercing shells with tracer and small base-fused bursting charge were used against tanks. Initially these were APCR (armor piercing composite rigid) projectiles with a tungsten core. Called wolfram in German, tungsten is a very dense and hard metal. Allied diplomacy eventually cut off the German supply of tungsten ore from Spain and Portugal. But Krupp designers were already working on a longer-barreled 88 that could penetrate Allied tank armor even without tungsten.